We kick off this week with a digital painting based on one of the photos I took Saturday at the South Charleston Summerfest car show. I had already packed up my regular camera when I saw this perfect composition right in front of me on D Street. I snapped it on my cellphone (not a smartphone) and it came out perfect, with no cropping required and a really cool sun glint on the Tri-Five Chevy. Once home, I tweaked it color-wise and painted over it with my digital oils. You can find the original picture in the photo essay I posted Saturday night. As always, click to enlarge. Fans of cutting-edge art will want to head down to WVSU this evening. At 6 PM the opening reception for Michael McKowen’s The World of the Willing happens. You can read all about it in last night’s Sunday Evening Video. 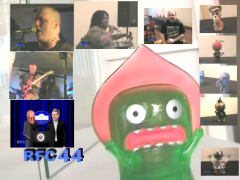 Later today, check PopCult for The RFC MINI SHOW starring Chuck Biel’s Jazz Lab One. Tonight PopCult brings you the first art show clip that we’ve done in years. Michael McKowen has an amazing installation opening Monday evening at the Della Brown Taylor Art Gallery at West Virginia State University, in the Davis Fine Arts Building. The show runs through September 18. 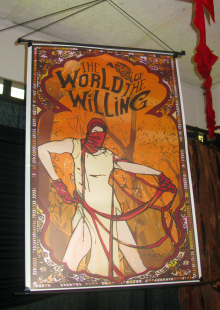 The World of the Willing is a multi-media exhibition, featuring paintings, assemblage, sculpture, films, illustrations and designs. These various artistic mediums are assembled to provide the viewer with the opportunity to explore a world that is both foreign and familiar. This is really engrossing stuff. McKowen has created a surreal narrative that’s still being assembled, combining film with found art, repositioned materials, filmed elements, and the stars of the show, a series of intricately-crafted little boxes that light up when you push a button so that you can look inside and experience bizarre and surreal new worlds. McKowen creates all this using talents honed during his years designing sets, costumes, and props for a variety of stage productions. He’s worked on everything from experimental theatre to major Broadway productions. 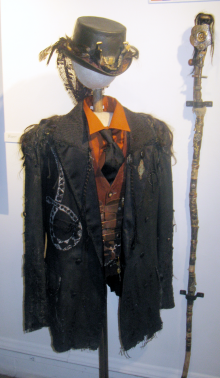 Much of his work has been repurposed or salvaged from prior projects. Not all toys are for kids, and not all toys can be kept on a shelf or put away under a bed. 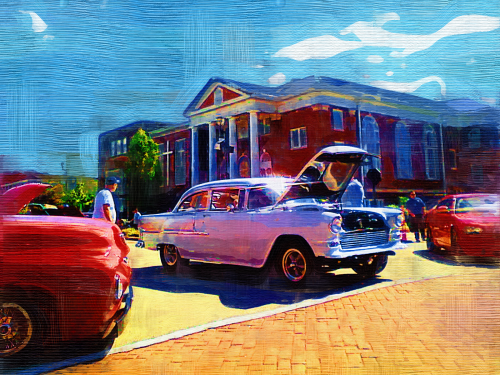 I am once again talking about cars–full-sized classic cars, the likes of which were on display earlier today at South Charleston SummerFest’s annual classic car show, which took up much of D Street and almost wrapped around the Mound. 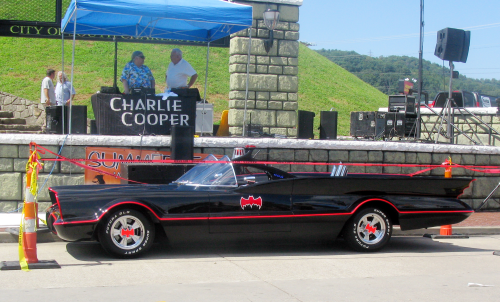 Legendary Charleston DJ, Charlie Cooper, was on hand, spinning the oldies and Batman returned with his 1989 costume and replica 1966 Batmobile. It was great to see a replica of the first official Batmobile, designed for the Batman TV Show by George Barris. 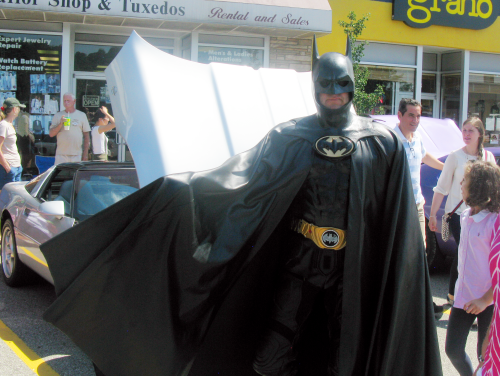 This cool replica attracted tons of kids (and adults) and there was a long line to get The Dark Knight’s autograph. Since we just got back and had to sort through and edit hundreds of photos, there will be minimal captions for this photo essay. Still, enjoy the eye candy. 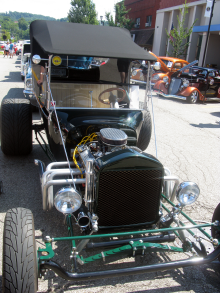 We have plenty of pictures of the cool cars and the people who came to see them in South Charleston earlier today. 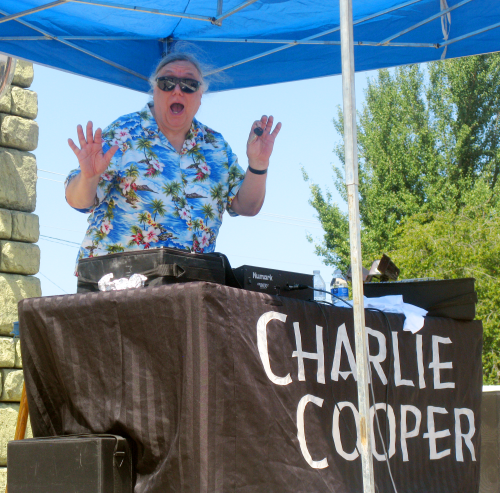 Charlie Cooper, caught in the act! Lenny Robinson, in one of his final appearances as Batman. From June, 2008, comes Radio Free Charleston episode 44, “Social Distortion Shirt,” the second of two episodes that I hosted without wearing a hat. This episode features music from Lady D and Quick and Dirty, plus footage from the Pandora’s Toy Box custom toy exhibit. Of special interest in this episode is our exclusive apology to the people of West Virginia from the Vice President of these United States. Host segments were shot at Good News Mountaineer Gallery, which is now the home of Apartment Earth. The bittersweet part of this show is that it marks the debut of Quick and Dirty and the band’s bassist and lead singer, Randy Lee Walden, who would die of a drug overdose less than three weeks after this show debuted. It was a terrible waste of a talented life. You can get just a hint of what we’re missing by watching this show. Original production notes are here. First, although it’s a reasonable assumption given my level of fantacism for the band, this shirt has nothing to do with DEVO. It features The Idaho Spud Candy Bar, which has been a regional favorite in the Northwest for nearly a century, but which is virtually unknown in other parts of the country. How I came to be aware of this candy bar requires links and references to another blog. 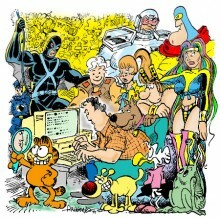 I’m a big fan of Mark Evanier and read his blog, News from ME, every day. Mark’s had an amazing career as a writer and producer working with everyone from Jack Kirby to Sergio Aragones to producing the Garfield cartoons and story-editing a season of Welcome Back Kotter. He also writes one of the most entertaining blogs in the world. Last February, he ran an encore of a post from 2006. This was a flash back to an incident in his youth where he and his friends went to see a double feature, a trip to the snack bar ended badly and a candy bar was thrown at the movie screen…where it stayed, apparently for weeks. You need to read Mark’s original post because he tells the story in such a hilarious fashion and I don’t want to simply reprint his post here. What’s so special about this edition of Stuff To Do, you ask? Well, I’m running it on a Thursday, instead of as part of The PopCulteer. Also, it covers four days. Also, it’s taking the place of The PopCult Bookshelf today. The reason for all this? It’s my birthday, and I don’t want to spend the whole day writing. But, I don’t want to break my streak of consecutive days with at least one post just five days away from the two-year mark of that major undertaking, so I’m doing this. As you probably know, with Summerfest and Deni Bonet playing Huntington the next two nights, this weekend is already loaded. We’re going to post graphics of the highlights of other cool things in and around town, and tell you about a cool annual festival that kicks off tomorrow. The Simply Jazz & Blues Festival kicks off another great line up, bigger and better than ever, with three days packed with Jazz, Blues and Gospel music! This festival is founded on the premise that W.Va. has woven a rich tapestry of music that includes jazz and blues. Now it’s time to share our treasures and invite the world to enjoy what we have to offer here in beautiful southern WV. 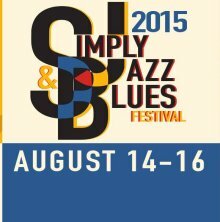 So join us on August 14th-16th for the 3rd Annual Simply Jazz and Blues Festival, returning to Word Park in uptown Beckley, WV. FREE events in Word Park and on Neville St. Ticketed performances inside The Raleigh Playhouse and Theatre! $25 Advance/ $30 at the door. Check their website at www.simplyjazzandblues.com for the Artist line-up and schedule, Jazz and Blues Takeover venues, Blues In the Schools program and hotel information. Call 304.222.2536 or email info@simplyjazzandblues.com for more information! 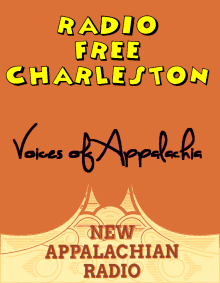 A new podcast which I am producing (but not hosting) has made its debut over at Voices of Appalachia. The ShockaCon Horror Show is a collection of interviews, panel discussions and performances from the archives of ShockaCon, presented by your host, Lee Harrah. Most episodes will be 30 minutes, while others will stretch out to a full hour. ShockaCon is, of course, Charleston’s premiere horror, science fiction and fantasy convention, and this year it happens on September 18, 19 and 20 at The Beni Kedem Shrine Center on Quarrier Street in Charleston. This year’s guests include Bai Ling, Ari Lehmen from Friday the 13th as well as cast members from The Walking Dead and American Horror Story, plus tons of other cool stuff that I’ll be telling you about in the coming weeks. Check out their website for more details. You can listen to first episode of The ShockaCon Horror Show, in which Lee introduces interview segments with Fred Williamson and Jennifer Lynn Warren (from American Horror Story) and a dramatic reading by Vernon Wells with Jon Carl Buechler, plus live music from The Renfields, right here in this widget HERE, or over at Voices of Appalachia. 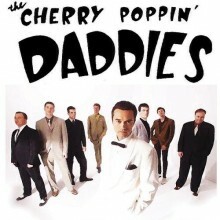 Our first song this week is The Cherry Poppin’ Daddies, with their take on Frank Sinatra’s classic, “That’s Life,” from Return The Evening, their most recent album, a tribute to The Rat Pack. While CPD is known as Northwestern band, their lead singer, Steve Perry (not the dude from Journey) was raised in Appalachin, New York, which is well within the Appalachian Region. That means that we can get away with playing this great band that made their name as a Swing Revival outfit, but really run the gamut from Ska to R&B to country. You’ll get a taste of their country side later in the show. Our theme hour is Bongwater, featuring Charleston’s own Ann Magnuson. That comes up in our second hour. You can listen to the show in this widget HERE, or look us up over in the VOA archives. Before the Bongwater tolls, we bring you an hour of great local and regional music! While we’re waiting for the latest Radio Free Charleston podcast to be uploaded, I thought I’d tell you about a new West Virginia-based podcast hosted by my friend and former Crowza message board sparring partner, Joshua Exline. True to form, his first guest is Robert Breedlove, the mogul of Toy Hutt, and also the first guest on Mark Wolfe’s podcast, The Real. To his credit, Josh acknowledges Mark’s podcast and covers hardly any of the same topics that Mark did when he interviewed Robert. It’s a great interview, and it runs just over an hour. You can listen to it HERE, but make sure you visit the West By Pod site for notes and other cool stuff like sample shows. We’re looking forward to hearing more from this podcast. Radio Free Charleston’s 210th episode, “Idaho Spud Shirt,” is a fun August treat, with a blend of different types of music and lots of our trademark mind-hurting weirdness. This week we have music from Time And Distance, Christopher Vincent from Qiet, American Murder and Chemical Lizards, plus we have animation and other stuff. We open the show with Paul Calicoat and the crew from Route 60 Music performing a little jingle they wrote about their music shop, located in Barboursville. I would imagine that if area musicians shot video of themselves singing this jingle, and posting to the Route 60 Music Facebook page, it’d put a big smile on Paul’s face.